Morotai Island, lying to the north of Halmahera, was an important air base during World War II, first for the Allies and later for the Japanese until its recapture near the end of the war. The ghosts of war still linger in this area, where many wrecks of aircraft and rusting guns lie abandoned in the bushes. The coral reefs here are not easily forgotten. 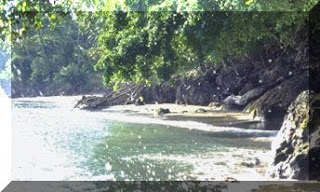 Wayabula, Berebere, Busus-busu, Sangowo and Daruba are villages on the beach.